Christian Mingle Review - Is this dating site worth it? 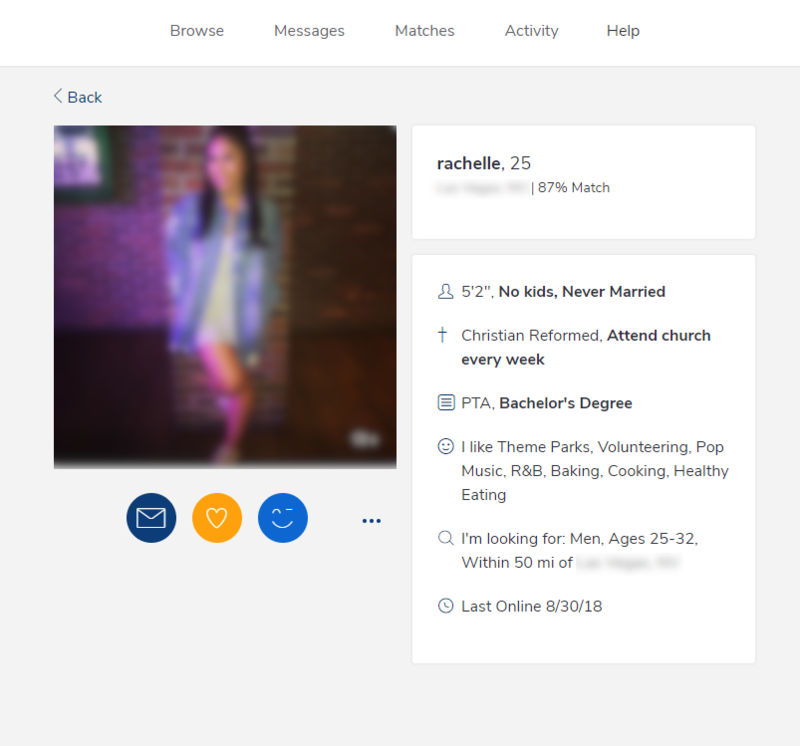 Christian Mingle Review – Is this dating site worth it? We always get excited when we get the opportunity to review one of the heavy-hitters of the online dating world. These sites come with the biggest names, the most notoriety, but also the biggest shoes to fill. When an online dating site like Christian Mingle is regarded as one of the “top sites” in the world, we get excited, but we also pump the brakes. Read on to see more of what we’re talking about in our Christian Mingle review. Just because an online dating site has a lot of hoorah surrounding it, it does not necessarily mean that it’s one of the best sites. On that same token, the site could have garnered all that hoorah and excitement by being one of the best sites in the world. The good news is that we’re here to find out today. During our Christian Mingle review, we had our expert team dig through the dating site from top to bottom to see what they were all about. It’s important to point out that we NEVER let any online dating site pay us to get a better review or more favorable treatment. If we did that, we would be doing you a disservice, and you’d be reading an advertisement instead of a review. Thankfully, our integrity and our service to you are more important to us than the almighty dollar. If you’d like to know more about our review process,, we’ve put together a full breakdown of how we review online dating sites. Now that we’ve finished all the paperwork let’s get down to our Christian Mingle review! If this is not the first question you’re asking about an online dating site, you’re doing it wrong. Christian Mingle or any other dating site can have the coolest commercials and the best features, but if they don’t have amazing singles for you to meet, then what’s the point of using the site? This is the reason that the very first stop on our Christian Mingle review is here. Here’s the awesome news and spoiler. The quality of the singles on Christian Mingle was fantastic in all senses of the word. First, let’s look at quantity. We’ve seen stats that they have well over 8 million members and counting. Maybe 8 million and 1 after you get over there 😉 While these stats are great, we wanted to dig further and make sure that what we saw on the site matched these great numbers. In order to test this, we did several sample searches in a lot of different areas of the country. We changed around parameters of age, religious preferences, gender, and more to see what all popped up. Good news. Every search we did produced an impressive list of singles looking to mingles. Yes, it should say mingle without the S, but we wanted it to rhyme. So quantity was great…but what about the activeness of the members? Tons of singles are no good if they’ve all already found love and moved on from the site. 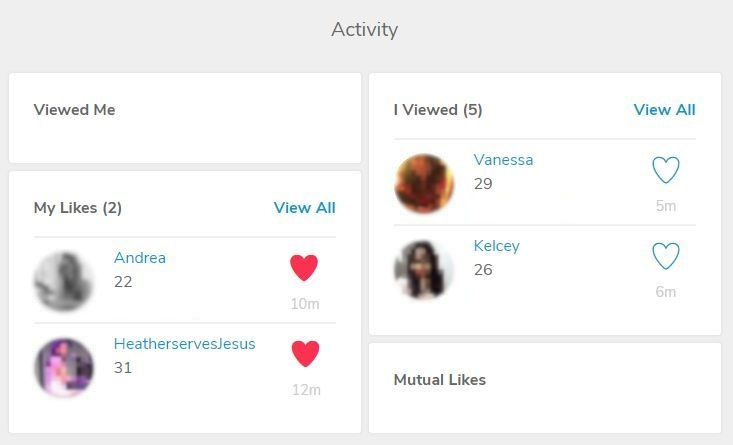 We found two ways to test the activity level of members on Christian Mingle. First, we look at the “Online” list of members for all of our sample searches. We wanted to see how many members were active at the very second we were testing the site. The verdict? The list went on forever. There were TONS of singles online. Yes, we know we sound like an excited school girl right now, but it gets us happy when there are online sites that are making things easy for people looking for love. We also began spot checking a ton of members on the other browse lists to see when they were on last. Almost every member we checked had been on Christian Mingle within the last week. We’re sure somewhere down the list there are some older members, but we didn’t find any, and we scrolled and clicked for a long, long while. So quantity is great…activeness is great…the last box that we have to check off on this Christian Mingle review is if the quality of matches is, well, actually quality. Are they desirable people? Are there people from all walks of faith? Are there attractive and real people? Are there people from all different age brackets? Do the people generally seem excited about online dating? Our answer to this is going to be our opinion as you can’t really put that into numbers. Our verdict from every single one of our reviewers was that the quality was some of the best they had seen. The profiles were real people who had a lot going for them. They seemed excited about the process and excited about meeting other singles like you. We say TONS of people from all different denominations including Catholic, Baptist, Methodist, Lutheran…actually, let’s just show you a list of the different religious options they have on Christian Mingle. Here’s our verdict from our Christian Mingle review. 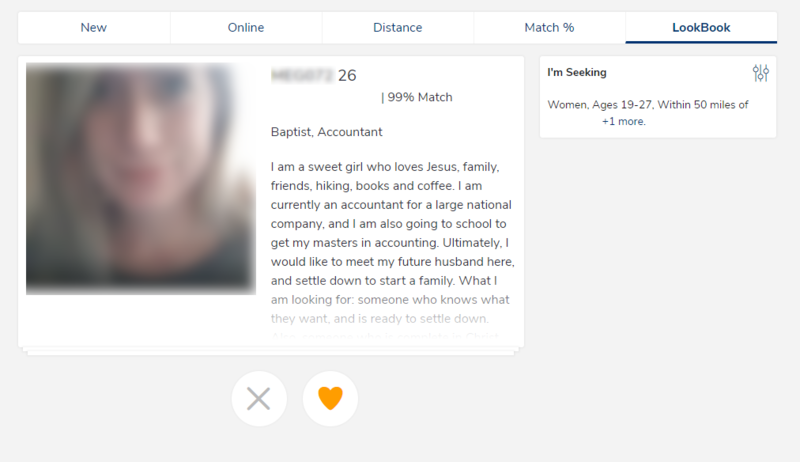 With the risk of sounding like giddy schoolgirls, Christian Mingle had one of the best choices of Christian singles we’ve seen in a long time. Quantity, activeness, and quality were all the best of the best. The process of creating an account at Christian Mingle is easy and takes about 5-10 minutes depending on how much information you want to fill out before looking at matches. When you first start the sign-up process, you put in your most basic info (email, age, and location) and then are prompted to load up a picture. The one thing that we did note is that you are required to upload a picture before moving on with the sign-up process. This is not the case with some sites, but it does translate into a higher quality experience. If they make everyone load at least one picture, then you won’t have to flip through a bunch of profiles with no pictures which is no fun. Update: It looks like Christian Mingle no longer requires you to upload a picture right away. While we thought this was going to be a negative, that appears to not be the case. 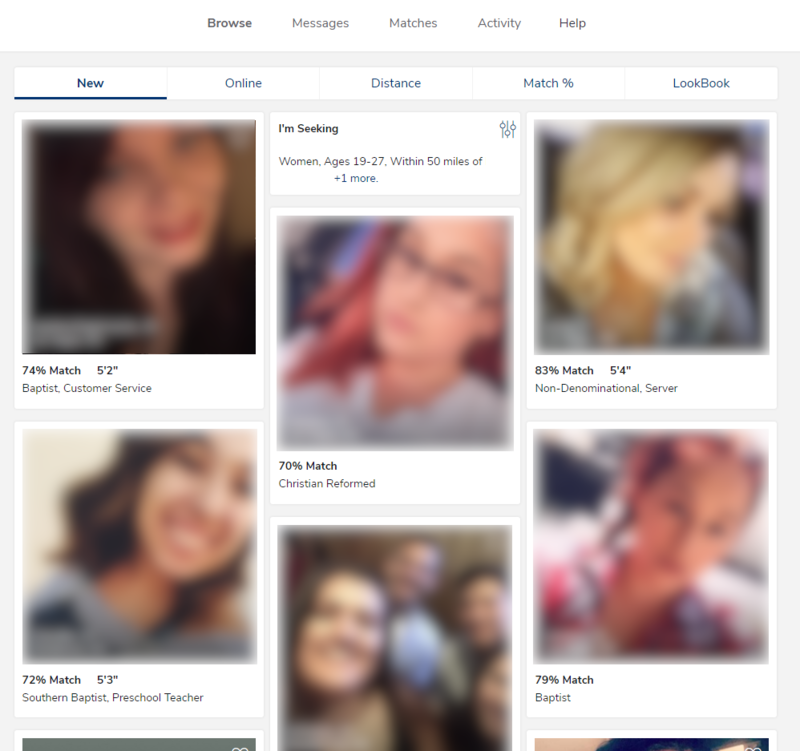 During our most recent update to our Christian Mingle review, we decided to test and see if the site was not riddled with profiles without photos. Surprisingly, that was not the case. It looks like everyone here is interested in finding love and taking the process more seriously than at other sites. So, good news for those of you that want to look around without uploading a picture right off the bat, you’re all set. After you upload your picture, you will be prompted to answer more questions about yourself for your profile. Here’s what that screen is going to look like. Notice at the top right of the box you have the option to skip all of this. This is the same on every page of Christian Mingle’s sign up process. 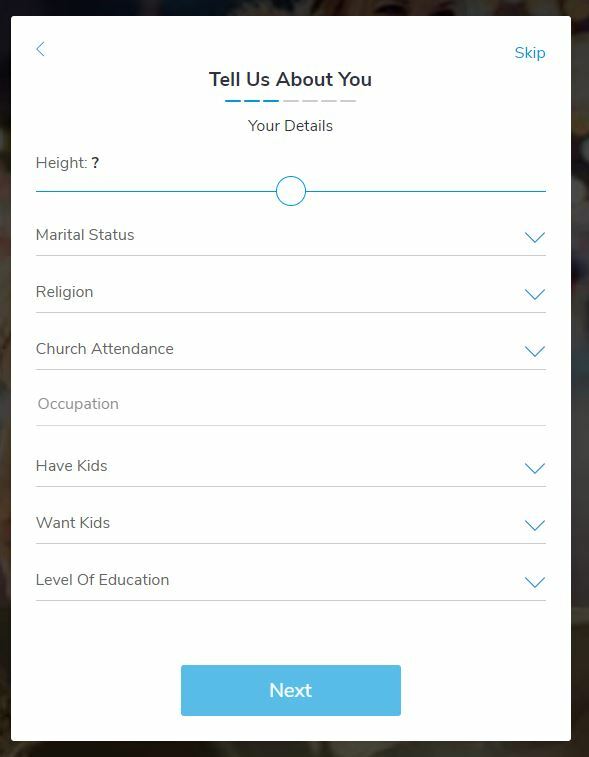 If you just want to look at matches before committing to filling this out, no worries! The only thing you will have to do is load up a picture. The one thing we did like about Christian Mingle’s sign up process was that at the end they make it very easy to know how to browse with your free trial. Some online dating sites like to make you think that you have to sign up and the button to get to browsing for free is hard to find. Here’s what it looks like on Christian Mingle. They make it super easy to start browsing before paying most likely because they believe in their product. The whole process takes about 5-10 minutes max and even less if you aren’t filling out much of your profile. If you want skip the rest of our Christian Mingle review and get started browsing with the free trial, click the link at the top of this page and it will automatically activate the free trial for you. Not a fan of computers? Don’t have hours to learn how to use something? Looking to try and make online dating easier? If you answered yes to any of these questions, you’re going to love Christian Mingle. An online dating site usually has two routes it can go when they set up their member area. They can jam pack it full of features (some useful and some just flashy), or they can go the simple route. Each has their own pros and cons, but personally, we’re bigger fans of the simple route. Too often, online dating sites will overload the members with too many features, and it becomes like work to try and find someone special. When they go the simple route, though, things become easy. You don’t have to try and understand a million features, and you can focus on finding love. During our Christian Mingle review, we found that they opted to take the simple route. They’ve got the adequate features you need, but not too much that it makes navigation challenging. Here’s a peek at all of the options available on Christian Mingle that are conveniently listed at the top of your member area. Here’s a sample of what the profiles look like on Christian Mingle. Notice again how simple things are. You have your basic details, your pictures, and a button to message them, favorite them, or wink at them. They don’t overcomplicate things with information overload or a messy design. Also, you’ll notice that a few things including the photo are blurred out. When you log-in and look at profiles, they won’t be blurred out. We blur out sensitive information of members when we’re doing our reviews. You’ll be able to see everything when you search through Christian Mingle. 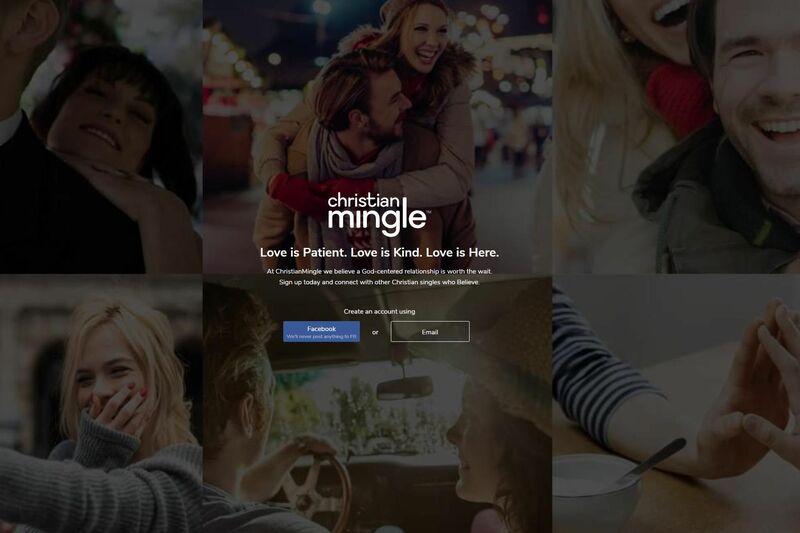 Christian Mingle takes the cake for simple design and ease of use. If you love millions of features, it might not be your favorite, but if you love simple and easy to use (as you probably should), you’ll be happy at home here. It’s funny that things that could seem like negatives are actually positives. During our Christian Mingle review, we definitely thought this was the case. The site did not have as many bells and whistles as the rest of the industry and frankly, we loved it. Let’s walk you through the different features they have and the one that we would like to see them add in the future. The first thing you’ll see when you log in to your account (paid or free trial) is the browse page. This is a feed style list of all of your potential matches. Here’s what that looks like. Yes, we have blurred out the photos, but on your free trial or paid membership, all of this will be crystal clear for you. This list goes on for miles, and as you scroll down, new people are automatically shown to you. If you see a single that you’re interested in, you click on them, and it takes you to their profile. There are four different options of people you can browse through under this feature. New Members – These are going to be the newest members to join Christian Mingle. Online Members – These are members who are actively online currently. Distance – These are members sorted by proximity. The closer to you a member is, the higher they will show on the list. Match % – These are the members sorted by how much they match with you based on Christian Mingle’s search algorithm. Each of these sections will react to what you set your preferences as for what you are seeking. These operate somewhat like a search function would, though, we would like to see a pure search function added one day. These browse sections make up for it, but we’re picky and want our cake and to be able to eat it too. Here are the options you have to pick what types of singles show up in your browse features. All of these search features are available with the free trial and the paid memberships. Here’s what that page looks like. Again, we’ve blurred the members because these are real live screenshots from inside Christian Mingle. Christian Mingle has a feature known as LookBook that is a yay or nay type matching function. This was one of our favorite features we found during our Christian Mingle review. Basically, it operates where they show you a picture of a member with some of their basic information, and you can select if you like them or not. If two singles like each other, the system will notify you both of the match. This is a great way to see some fresh faces and possibly spark up some interest with someone. As we expected would be the case with our review of such a big online dating site, they had support all squared away. Christian Mingle had an extensive FAQ section, email support, and a live chat feature that was available right at the bottom of the page from within your account. They have all of this in a fully dedicated and easy to find help and support section of their website. The only thing that we didn’t see was phone support which is not industry standard to have, though. Well done Christian Mingle. We hope never to have to use your support, but it’s great to know that it’s there waiting if we ever need it. Now that we’ve finished our Christian Mingle review, you’re wondering what it costs to become a paid member. 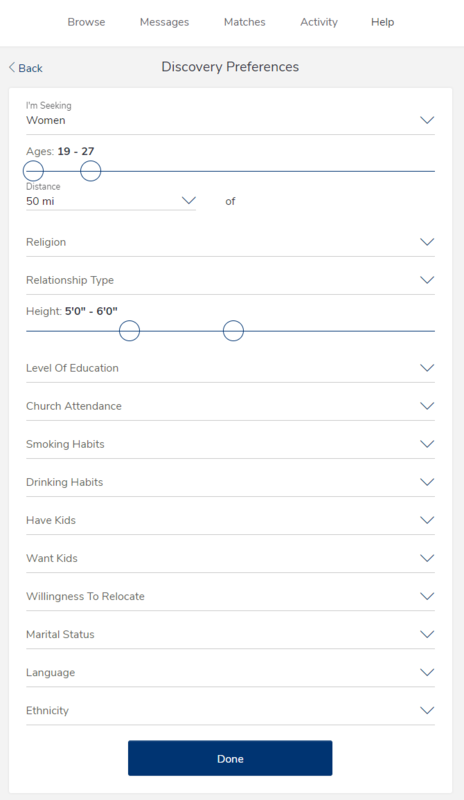 Christian Mingle has two different membership levels and three different term lengths within each. We’ll walk you through all of them and what you get and don’t get with each. 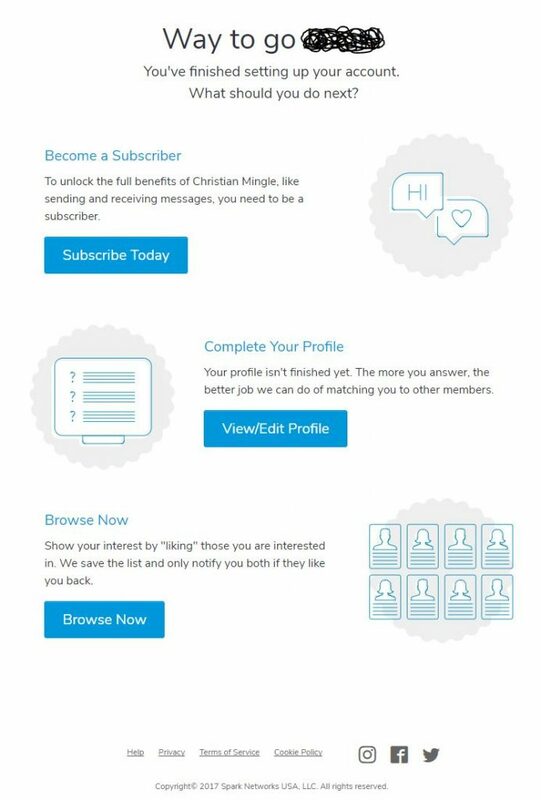 Update: Christian Mingle has updated their membership structure and no longer has two different paid memberships to choose from. Your only option now is the Premium Membership which comes with all of the features the site has to offer. All of these memberships have a one-time $3.99 processing fee (not included in the totals above). The $3.99 processing fee is a one-time fee that we don’t see any way around. If you ever renew with Christian Mingle, it does not look like they ever charge you this again. Update: Here’s a fun update we have for you! Christian Mingle has since gotten rid of this one-time processing fee. Sounds great to us. One of the biggest differences between the two plans (when they had two) was the messaging plus function. Now, you get that feature with the Premium membership. You don’t have to pay extra for it and they didn’t get rid of it. The messaging plus means that you can message ANY member on the site and they can respond regardless of whether or not they have a paid membership. This means that if someone came on to browse and created a profile but never joined, you can still talk with that member! They’ll get an email about your message and most likely come back on to see what you’re all about. What we HIGHLY recommend you do is click the link below and take a look around for yourself. After finishing our Christian Mingle review, we were raving fans of the site but you need to see if it’s right for you on your own. Take five minutes and take a peek around. If you like what you see, give it a shot! If you don’t, no worries. You can leave your profile on there in case a premium member comes along and sends you a message. We think you’re going to be happy with the quality you see, though, and are going to want to join.